As the two ends of the rubberized bar touched each other, I remembered how, back in October, I could barely bend it at all. I couldn’t hold a 2-1/2-pound weight, while now I have no problems with 10-12 pounders. Not too long ago, I reached to grasp something with my right hand, something I hadn’t done since I broke my wrist over the summer. Progress. And much of it achieved through very small baby steps. Too often—and I am frequently guilty of this—we want to improve immediately. If we want to lose weight, we seem to think that refraining from dessert for one night should translate into an immediate loss of at least 3 pounds. Increasing our workout twice should mean cut arms, and saying we need to raise more money should result in—right—more money raised! But, alas, things don’t happen that way. Baby steps do work….over time, and with effort. Sending out an appeal after not doing so for some years will not result in a lot of positive responses. Nor will reaching out for the first time to your donor list. You have to do it, and then do it again, and then struggle to keep on doing it. To be successful I think you have to think big, but often act small. If you want to double what you are raising know that it could take years to reach that goal. But don’t lessen that goal, just be more realistic about what it will take to get there. That starts with doing a real assessmentof your fundraising program and the resources you have to improve your results. By resources I mean mainly human ones—people to identify, cultivate and solicit prospects, and people who are viable prospects and donors. 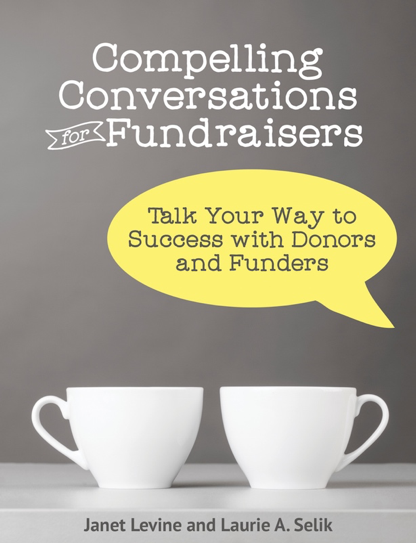 This includes a board that is both well connected and engaged and someone on staff who understands how to facilitate board members’ fundraising activities. You also, of course, need to have a plan. One that is strategic, thoughtful, viable, and considered. A plan that looks at your resources—both the human ones and those that include your mission, your programs, the people you serve—and that identifies the ways you will fundraise, the steps you will take and who is responsible for what. But a plan is just the first step. The real test is whether someone—preferably everyone—uses the plan, follows the steps, and actually raises money. Critically, everyone must also understand that yes, raising $300 can be a win. It won’t keep your doors open, but it is a baby step in the right direction. As is asking someone for a meeting, for a gift, to come to an event. Any action will lead to many actions, and those will ultimately get you where you want to go. Janet Levine works to move nonprofits from Mired to Inspired. Get inspired at http://janetlevineconsulting.com. Subscribe to the newsletter, and contact Janet for a free 30-minute phone or zoom consultation. This entry was posted in fundraising, planning and tagged assessment, development plan. Bookmark the permalink.